Cigar boxes and sparkles are the way to a teachers heart! 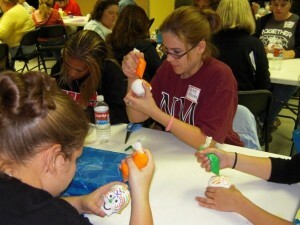 Earlier this month we had our first Educator’s Overnight of the school year and the theme was Day of the Dead! This topic has been near and dear to the Education department and we always manage to have one or two activities for teachers or students surrounding the Dia de los Muertos celebration. Teachers adding details to their cigar box altars! We had a great time getting everything ready for the activities. We had plenty of things planned so that the hours would be full of things to do. Our goal was to make activities that teachers could “try” and then take back with them to their classroom to use with their students – what we didn’t expect was that the teachers would have so much fun with the arts and crafts! Kathleen Havens, the assistant director of youth education here at the museum, put together an awesome curriculum and gave the teachers the jumping off points and examples for all of the hands on activities. 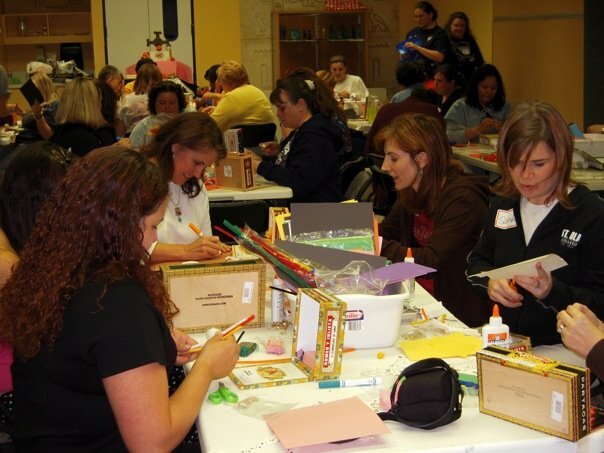 These enthusiastic educators transformed their simple cigar boxes into detailed works of art! The teachers decorated ‘calacas’, went through the process of making sugar skullsand then decorated some pre-made sugar skulls with colorful royal icing, created mini-altars in cigar boxes and painted Catrina-shaped fridge magnets. If you’ve ever worked with a group of kids on a project and you hear groans when you say “ok everyone, 5 more minutes and then we’re going to move on” you would be completely familiar with the sounds we heard from this group of teachers! They were so excited to continue working on their mini-altars, creating tiny bouquets of flowers out of modeling clay, cutting out tiny papel picado from construction paper, building stairways and platforms for their tiny clay loaves of bread to perch upon… these teachers were going to town! After the allotted time for hands-on activities had finished for the night David Temple took the group on a flashlight tour of the Hall of the Americas and the Paleontology Hall. Then some teachers decided to call it a night, but others asked to be able to go back and work on their altars – how could we say no!? By about 3 am, everyone had finally headed up to bed and then it seemed like only moments later I was waking everyone up for breakfast at 7 am! Just imagine, those teachers were up in time for school on Friday and still up at 3am on Saturday morning with plenty of energy – that’s absolutely incredible! I hope that they took their projects back to share with their students and spread the enthusiasm for Dia de los Muertos they shared with us at the Overnight! Gel food coloring (found in the cake decorating section of any cooking store) is used to make the really vivid colors of royal icing! This was the second Educator Overnight that we’ve had here at the HMNS, and I think we all agree that it was both a sucess and a lot of fun! We’ll be hosting our next Educator Overnight – Mummies, Tombs and Catacombs in April and registrations are already rolling in! If you’re not so excited to sleep in the Museum we also offer 3 hour ExxonMobil Teacher Tuesdays. The next one up is ‘Polymers!’ with Carolyn Leap which should be lots of fun too! Want more info? The recipes we use to make sugar skulls and the icing to decorate them can be found online at Mexican Sugar Skull.com – they also have a lot of other cool Day of the Dead related items to check out. I have included a few photos here and have posted more (with some closeups of finished sugar skull designs) on our HMNS Facebook page. If you want to become a fan of HMNS you can check them out!